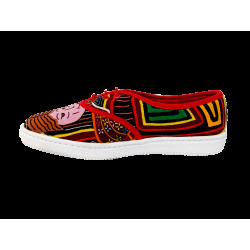 Motalas is a company dedicated to make shoes and accessories using Colombian handcrafts. The factory, located in Bogota, started operating in 2002; today the business is an extended family formed of Colombians who work closely with indigenous communities. Motalas seen tillage Colombian indigenous and retains its essence. Its products convey the magic of crafts whose legacy has remained for generations in the ethnic communities of our country. The objective is through Motalas to share these brilliant craftsme stories that inspire a better world throughout its creative and authentic talent. In each art piece realities are reflected.